The FirstBIKE Street Light Blue Balance Bike (Brake) is the perfect training bike for developing your child’s sense of balance and motor skills. With brake and air tires ideal for urban areas with concrete, stone, or packed dirt surfaces. The FirstBIKE is the perfect training bike for developing your child’s sense of balance and motor skills. This expedient cycle is the ideal companion for walks and discovery journeys, because already young children can keep up with their parents walking speed without trouble. Quality Designed in Germany. FirstBIKE features the highest quality materials and parts. 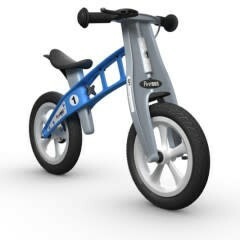 Educational benefits, style and great fun are why FirstBIKE is first choice for toddlers and parents worldwide. Education. FirstBIKE gives children a head start. Experts agree that through the development of balance, gross motor skills and a sense of independence, children are given the confidence they need for further success, both socially and in the classroom. Materials. FirstBIKE is both durable and safe. The high quality composite frame is designed to minimize risk and maximize comfort. Unlike wooden or metal equivalents, FirstBIKE will not swell, scratch, splinter of rust. Growth. FirstBIKE grows with your child. The innovative lowering adapter (sold seperately) allows children to ride from as young as 22 months. The fully adjustable seat and FirstBIKE’s durability and reliability enable children to enjoy riding up to 5 years of age. Award Winning. Winner of toy awards across Europe, FirstBIKE can be enjoyed in the home, at the park and is an ideal travelling companion on walks. For boys and girls, FirstBIKE is the essential educational toy. Safety Stop. SAFETY STOP is the adequate and precise rear drum brake. It gives the child optimal control over the FirstBIKE and promotes the training of bike handling skills.